Recently, I noticed a whole bunch of opaque plastic bowls in a friend’s cupboard, being used as storage containers. They came from some frozen prepared “meal” from a supermarket. Not only relatively expensive but loaded with chemicals. It doesn’t have to be that way. Whether you are a cooking beginner, a busy student or a bachelor, or almost anyone, you can eat well with a minimum of trouble. (I guess if you’re in prison you don’t have much choice, but everyone else does). There are some simple fundamentals which quickly mastered will simplify cooking; taking it from a hassle to a welcome way to dine; less expensive and healthier than take-out or packaged factory-made “meals” found in supermarkets. I remember years ago in the New York Times, they used to have a column by a French chef, Pierre Franey. He left his native France and worked at the N.Y. world’s fair in 1939. After that he was renowned for his dishes at LePavilon restaurant in Manhattan. Coming from a humble background, he wanted to show that French cooking need not be a snooty, time-consuming affair. He proved this with his 60 Minute French cooking column. A popular food most people appreciate is chicken. 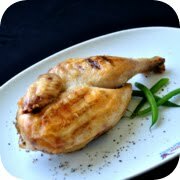 Chef Franey taught how to quickly broil a chicken with minimum seasoning, and then vary that with different herbs and spices. He then added a simple rice, noodle or potato side dish as well as a vegetable to accompany it. Since this is little more difficult than heating a corporate factory-made meal, I wanted to mention it. If you live alone, you could save the rest for another day, or invite others to join you. A simple Poulet Grille with vegetables and a nice dessert will make you feel good. Here is an example of wonderful, easy food at home, inspired by the 60 Minute French Cooking column from years go, still relevant today. When you first put the chicken in the broiler, you can make some rice. Simply put one cup of rice into 1-½ cups of boiling water with a little salt and boil gently for 12-15 minutes. Taste a grain of rice to see if it is done. When done put a tablespoon of butter into pot and cover the pot off heat. Just before serving, stir rice with a fork. If you like, you may easily make some string beans (green beans). Start these just prior to broiling the chicken, when you put the rice on. Put a pot of water on to boil. Rinse beans and put into salted boiling water to cover. Boil gently, uncovered, for eight to ten minutes. Taste one to check if done. Drain the beans and put back into the hot pan with the butter. Now sprinkle the juice, parsley and pepper into the beans. Stir and serve. There you have it, a tasty meal in the French style. Made quickly. Real food, Enjoy.